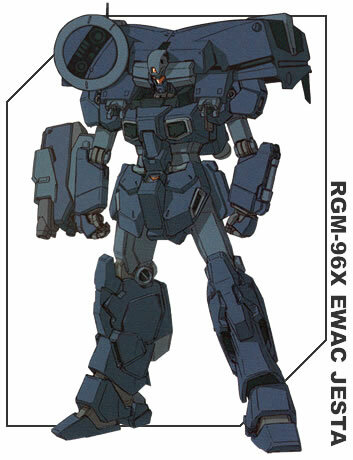 The RGM-96X EWAC Jesta (Jesta EWAC Type) is a derivative of the RGM-96X Jesta, modified for reconnaissance operations and fitted with electronic warfare equipment (early warning and control). It is identified by the recognition code U011 (uniform Eleven). Currently four Jesta units have been assigned to Londo Bell, along with all of the necessary parts and equipment to reconfigure them into either the Cannon or EWAC variants. Typically their deployment formation calls for two nonconfigured Jesta, and then one suit in the Cannon and EWAC configurations respectively.